What does it mean to be a journalist? For the past 25 years, Bill Lueders has been News Editor of Isthmus, and the paper has reflected his tenacious quality of getting to the bottom of the story. Examples of Bill’s award-winning work are documented in his revealing book, “Watchdog: 25 Years of Muckraking and Rabblerousing,” a collection of the “Best of Bill Lueders” opinion columns, longer investigative stories, and other more personal writings. In addition to sharing highlights from some of the stories in his book, Bill talks about his career, “tips” on what makes an investigative journalist, and his new role with the Wisconsin Center for Investigative Journalism. Bill is leaving Isthmus and joining the Center to head a new project, Maplight.org, where he will be working to tell the stories about the impact of money on politics. 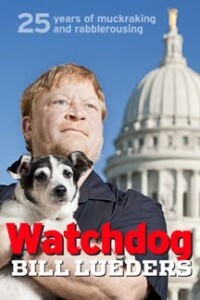 A tailor-made role for a top Watchdog!